The Japanese city of Hiroshima was destroyed when the United States dropped a single nuclear weapon, the “Little Boy” atomic bomb, on 6 August 1945, instantly killing over 70,000 people and horribly wounding even more. This was the first time a nuclear weapon was used in war. Photo: at the time this photo was made, smoke billowed 20,000 feet above Hiroshima while smoke from the burst of the first atomic bomb had spread over 10,000 feet on the target at the base of the rising column. Credit: George R. Caron; U.S. Air Force; Wikimedia Commons. Three days later, for the second – and, so far, only other – time in history, another nuclear weapon was used to destroy the Japanese city of Nagasaki. Six days later, on August 15, Japan announced its surrender. World War II was over. The decision to use nuclear weapons on Hiroshima and Nagasaki remains controversial to this day. 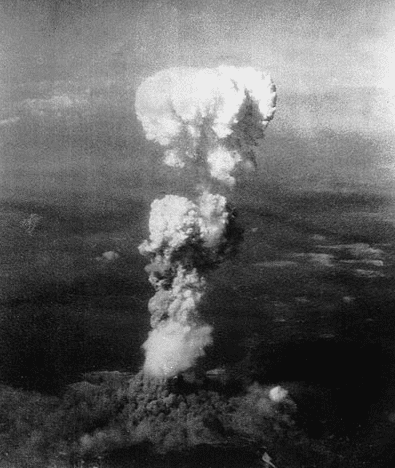 President Harry S. Truman and other government officials insisted they used the bombs to save lives, certain that Japan was determined to fight to the bitter end and that millions of civilians and soldiers would die if the U.S. invaded Japan. On 26 July 1945, allied leaders including Truman had issued the Potsdam Declaration warning that if Japan refused to surrender, “the inevitable and complete destruction of the Japanese armed forces and just as inevitably the utter devastation of the Japanese homeland” would follow. Japan did refuse, and Truman made the decision to use the atomic bombs. 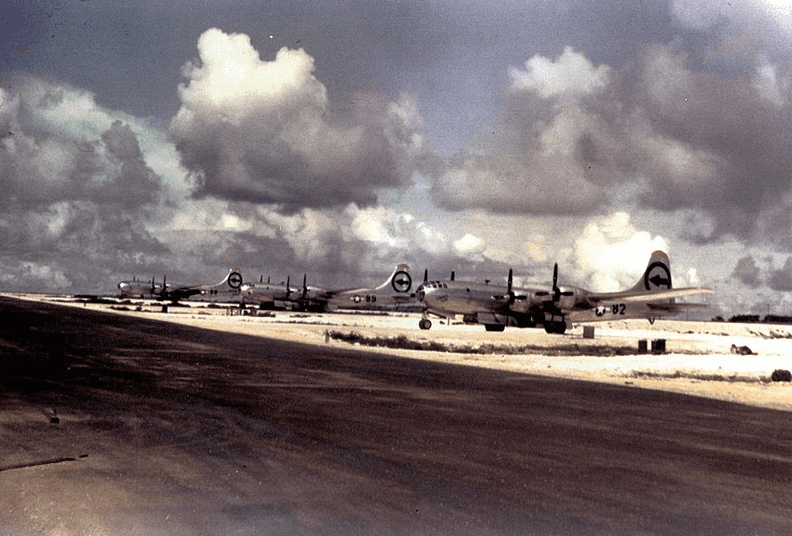 Photo: 509th Composite Group aircraft immediately before their bombing mission of Hiroshima. Left to right: Big Stink, The Great Artiste, and Enola Gay. Credit: Harold Agnew; Wikimedia Commons. Critics of the decision say it is immoral and unnatural to tear atoms apart to kill human beings, and that the allies already had enough conventional firepower to defeat Japan. Others say the real reason the bombs were used was not so much forcing a Japanese surrender as showing America’s powerful rival, the Soviet Union, that the U.S. had developed the most devastating weapon the world has ever known. 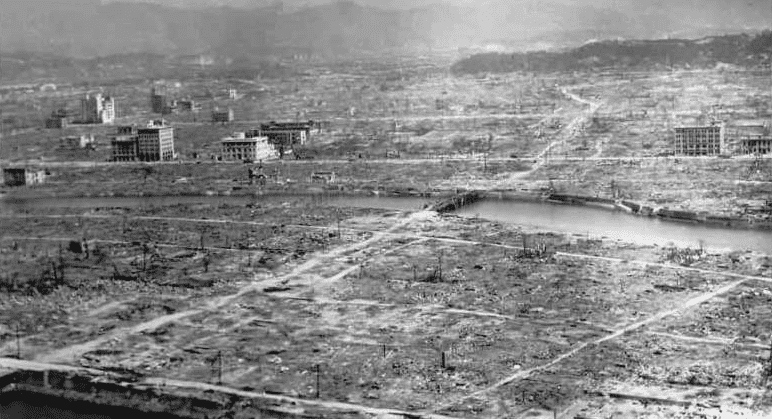 Photo: Hiroshima in the aftermath of the atomic bombing. Credit: U.S. Air Force; Wikimedia Commons. As the following newspaper articles show, when the American public learned of the atomic bombing of Hiroshima on August 6 the official rationale was made very clear: forcing a Japanese surrender without resorting to invading Japan. The articles also emphasize the claim that Hiroshima was a military target. WASHINGTON, Aug. 6. – An atomic bomb, hailed as the most-terrible destructive force in history and as the greatest achievement of organized science, has been loosed upon Japan. 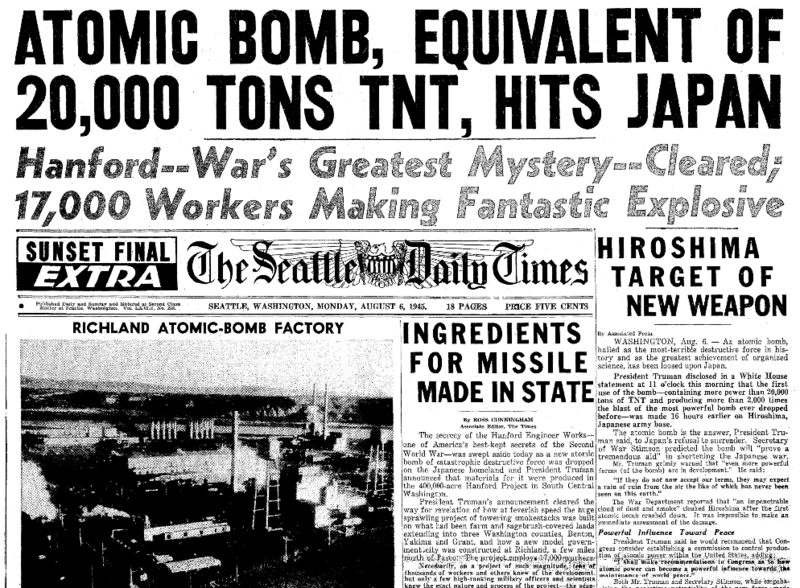 President Truman disclosed in a White House statement at 11 o’clock this morning that the first use of the bomb – containing more power than 20,000 tons of TNT and producing more than 2,000 times the blast of the most powerful bomb ever dropped before – was made 16 hours earlier on Hiroshima, Japanese army base. The atomic bomb is the answer, President Truman said, to Japan’s refusal to surrender. 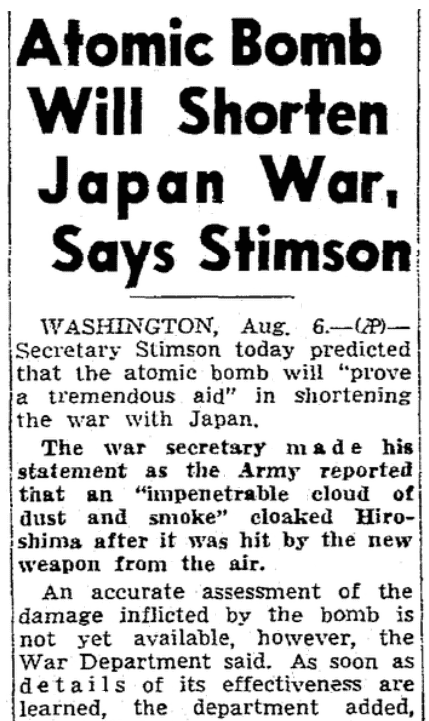 Secretary of War Stimson predicted the bomb will “prove a tremendous aid” in shortening the Japanese war. The War Department reported that “an impenetrable cloud of dust and smoke” cloaked Hiroshima after the first atomic bomb crashed down. It was impossible to make an immediate assessment of the damage. Both Mr. Truman and Secretary Stimson, while emphasizing the peacetime potentiality of the new force, made clear that much research must be undertaken to effect full peacetime application of its principles. The product of $2,000,000,000 spent in research and production, “the greatest scientific gamble in history,” Mr. Truman said the atomic bomb has been one of the most closely guarded secrets of the war. The base that was hit is a major quartermaster depot and has large ordnance, machine-tool and aircraft plants. The raid on Hiroshima, situated on Honshu Island on the shores of the Inland Sea, had not been disclosed previously, although the Twentieth Air Force on Guam announced that 580 Superfortresses raided four Japanese cities at about the same time. The city of 318,000 is also a key Japanese port. The President disclosed that the Germans “worked feverishly” in search of a way to use atomic energy in their war effort, but failed. Meanwhile, American and British scientists studied the problem and developed two principal plants and some lesser factories for the production of atomic power. “We have spent $2,000,000,000 on the greatest scientific gamble in history – and won. Mr. Truman forecast that sea and land forces will follow up this air attack in such numbers and power as the Japanese never have witnessed. The President said that this discovery may open the way for an entirely new concept of force and power. The actual harnessing of atomic energy may in the future supplement the power that now comes from coal, oil and the great dams, he said. That will have to wait, however, the President said, until the war emergency is over. WASHINGTON, Aug. 6. 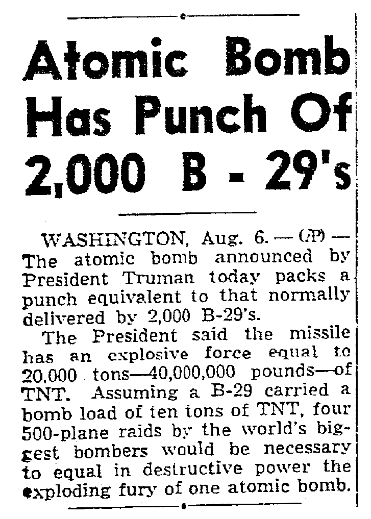 – (AP) – The atomic bomb announced by President Truman today packs a punch equivalent to that normally delivered by 2,000 B-29s. The President said the missile has an explosive force equal to 20,000 tons – 40,000,000 pounds – of TNT. Assuming a B-29 carried a bomb load of ten tons of TNT, four 500-plane raids by the world’s biggest bombers would be necessary to equal in destructive power the exploding fury of one atomic bomb. WASHINGTON, Aug. 6. – (AP) – Secretary Stimson today predicted that the atomic bomb will “prove a tremendous aid” in shortening the war with Japan. The war secretary made his statement as the Army reported that an “impenetrable cloud of dust and smoke” cloaked Hiroshima after it was hit by the new weapon from the air. An accurate assessment of the damage inflicted by the bomb is not yet available, however, the War Department said. As soon as details of its effectiveness are learned, the department added, they will be made public. Stimson said in his statement that the explosive power of the bomb is such as to “stagger the imagination.” He added that scientists are confident of developing even more powerful atomic bombs. Stimson said that security requirements do not permit disclosure of the exact methods of producing the bomb or the nature of its action. He did say, however, that uranium ore is essential to the production of the bomb. Development of the bomb culminated three years of work by allied scientists, industry, labor and military forces, Stimson said, adding that he was convinced Japan will not be in a position to use a similar weapon. While Germany worked “feverishly” to develop an atomic bomb, Stimson said, the Nazi defeat now has erased danger from that source. Stimson promised that further statements will be made public in the future to give additional details concerning scientific and production aspects. The secretary disclosed that development of the bomb was carried out by thousands of persons “with the greatest secrecy.” The work has been so divided, he said, that no one has been given more information concerning the bomb than was absolutely necessary to his particular job. The possibility of using atomic energy in the manufacture of weapons, Stimson said, was brought to President Roosevelt’s attention late in 1939. The Chief Executive named a committee to investigate and by June, 1942, Stimson said, sufficient progress had been made to warrant a big expansion of the project. Three plants to produce the bombs were started in December, 1942. Two of these are situated at the Clinton Engineer Works in Tennessee and the third at the Hanford Engineer Works in Washington State. The Clinton Engineer Works is situated on a government reservation 18 miles west of Knoxville, Tenn. The Hanford Engineer Works is situated on a 430,000-acre reservation 15 miles northwest of Pasco, Wash. In addition, a special laboratory to deal with technical problems has been established near Santa Fe, N.M. The laboratory is directed by Dr. J. Robert Oppenheimer, whose “genius and inspiration,” Stimson said, has been largely responsible for development of the bomb. “Already in the course of producing one of the elements much energy is being released, not explosively but in regulated amounts. Stimson said the atomic bomb had been developed with the full knowledge of and cooperation of Britain and Canada and substantial patent controls on the weapon had been obtained in those countries. President Roosevelt and Prime Minister Churchill many months ago decided that all work on the bomb should be concentrated in the United States in order to bring about quicker development of the weapon and to eliminate duplication. As a result of that decision, a group of British scientists who had been working on the problem were transferred to the United States late in 1943 and since that time had participated in the development of the project in this country. In addition, Stimson disclosed one of Denmark’s great scientists – Dr. Neils Bohr – was whisked from the grasp of the Nazis in Denmark and later helped in development of the bomb. Initially, Stimson said the project was placed under the direction of the Office of Scientific Research and Development with Dr. Vannevar Bush, director of O.S.R.D., in charge. At the same time the President named a general policy group composed of former Vice President Wallace; Stimson; Gen. George C. Marshall, chief of staff; Dr. James B. Conant, president of Harvard University; and Dr. Bush. This group in 1942 recommended a great expansion in the project and at its suggestion supervision of the work was assumed by the War Department. Maj. Gen. Leslie R. Groves, an Army construction engineer, was placed in control. In 1943, a combined policy committee was established for the project. This group, at the outset, included Stimson, Dr. Bush and Dr. Conant for the United States; Field Marshal Sir John Dill and Col. J. J. Llewellin, for the United Kingdom; and G. D. Howe for Canada. Colonel Llewellin later was replaced by Sir Ronald I. Campbell, who in turn was succeeded by the Earl of Halifax. Field Marshal Dill was succeeded by Sir Henry Maitland Wilson. Scientific advisors to the group included Dr. Richard C. Tolman for the United States members; Sir James Chadwick for the British; and Dean C. J. Mackenzie for the Canadian. To handle the problems arising from the control of the weapon and its implications for the peace of the world, Stimson said, he had named a committee on which he will serve as chairman. Other members of the committee are Secretary of State Byrnes; Ralph A. Bard, former undersecretary of the Navy; Assistant Secretary of State Will L. Clayton; Dr. Bush; Dr. Conant; Dr. Karl T. Compton, chief of the office of field service in the Office of Scientific Research and Development; and George L. Harrison, president of the New York Life Insurance Company and special consultant to Secretary of War Stimson. Assisting the interim committee as a scientific panel are Dr. Oppenheimer, Dr. E. O. Lawrence, Dr. A. H. Compton and Dr. Enrico Fermi. Note: An online collection of newspapers, such as GenealogyBank’s Historical Newspaper Archives, is not only a great way to learn about the lives of your ancestors – the old newspaper articles also help you understand American history and the times your ancestors lived in, and the news they talked about and read in their local papers. Did any of your family serve in World War II? Please share your stories with us in the comments section. WWII Japanese Soldier Surrenders 27 Years after War’s End!